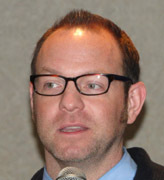 Brendon Fogle spoke of Independent Film Making in Seattle. The House Band belted out Monger’s Silver Gavel. Bill Prater gave his classification talk. Jeff Cashman emphasized a contribution by Every Rotarian Every Year to the Rotary Foundation. Rani Joseph visited us from Rotaract. Brendon then offered the BBRC a premier showing of his short film called “Sync.” This was an eight and a half minute film with a cross generational story that shows that youth and the more experienced members of a family can be connected in more ways than the bond of a common adversary. For his presentation Brendon was presented a certificate by President Elect Chris showing that one thousand pounds of produce will be donated to local food banks through Rotary First Harvest. John was skeptical, Frightened of the spectacle Monger might deploy. Monger’s evident, hunger for the President’s, Gavel is well known. But as he’s getting ready to go, A knock comes on the door. Clang! Clang! Monger’s silver gavel Makes sure the meeting’s swell. Back at Glendale now, Monger gets to fool around. Some will be annoyed. S0 when the meetings ready to go, He leaps up on the stage. Pounding Innagoddalavita. Oh, oh, oh, oh. The club does not agree and they tell him So, no, no, no. But as the words are leaving their lips, A noise comes from behind. Silver Gavel Ma, a, an. It might have been a Beatles tune, but then again, it might not have, but in any case it was entertaining and opened the meeting with a burst of energy. This was followed with the Invocation and pledge led by Curtis Cummings. Guests were introduced by Past President Brian Evison. Guests included Staff Sergeants Kevin Tran and Marc Weier of the US Army Reserve Recruiting center in Bellevue. It is their goal to gather a team for the Bellevue 10K and best the US Marine Corps. Go Army – Beat Navy!! Our very own Sergeant, Wendi Fischer, reinforced the wisdom of those members that ponied up $40 for the 2011-2012 “Sparkle Dollars”, by laying on a major Rotary trivia test. Who knew that February 23rd was “Rotary Day”, and that there were four founding members of the first club and that over 55,000 members attended the Osaka, Japan International Conference in 2004? Not many. Place your dollars on the table please. Just when you thought it would not get any better, it did. In essence, Bill Prater has learned from the ground up and now shares his experiences, for a fee, with business clients looking to grow productivity, sales, profits and the satisfaction of being. Growing up in Snohomish County Bill regarded his mother’s “No-No’s” as goals and objectives resulting in some bodily harm, but it did not kill him. As a three sport athlete in high school he learned that balance was important and good grades were essential to continued success, so he became a two sport athlete and a better student. A football scholarship to the UDub lasted a year until he did sustain bodily harm and was forced to work to support his education, which resulted in failing grades and his being “kicked out” of school. He received an opportunity to re-enter college by attending night school and earning A’s. Bill then discover that the “C” students did not take the time to ask what it would take to achieve an “A” in a course, and with this information he returned to school and finished with straight “A’s”. A blind date introduced him to his wife of forty-five years and they have raised two “pretty smart” kids, and really smart grandchildren, which are his support bench for his current business of business consulting that has developed “Your Business Toolkit”, a learning system for business professionals. To learn more about the toolkit visit: Leriot.com. Thanks for your talk Bill. We are glad that you choose the BBRC! Chris reintroduces the President of the Bellevue Rotaract Club, Rani Joseph. Rotaract is seeking young professionals between the ages of 18 and 30 that desire involvement in community service activities. The Bellevue Rotaract club has supported the BBRC with the Adoption Party, RFH, and the Bellevue 10K. Do you know anyone that might be interested in joining forces with Rotaract? If so, let us know. EREY: Every Rotarian Every Year. Jeff Cashman, Chairman of the BBRC’s Rotary Foundation Committee invited his committee members to the front and explained that it is not often that we can do something that involves 100% participation from all of our members. This year we have the goal of achieving 100% participation in supporting the Rotary Foundation. This is the means that allows Rotary to be involved in the elimination of Polio on a worldwide basis, to promote peace and better understanding between people and support humanitarian projects. A water well in Kenya will not generate headlines on the 6:00 PM news, but it will improve the lives of others.